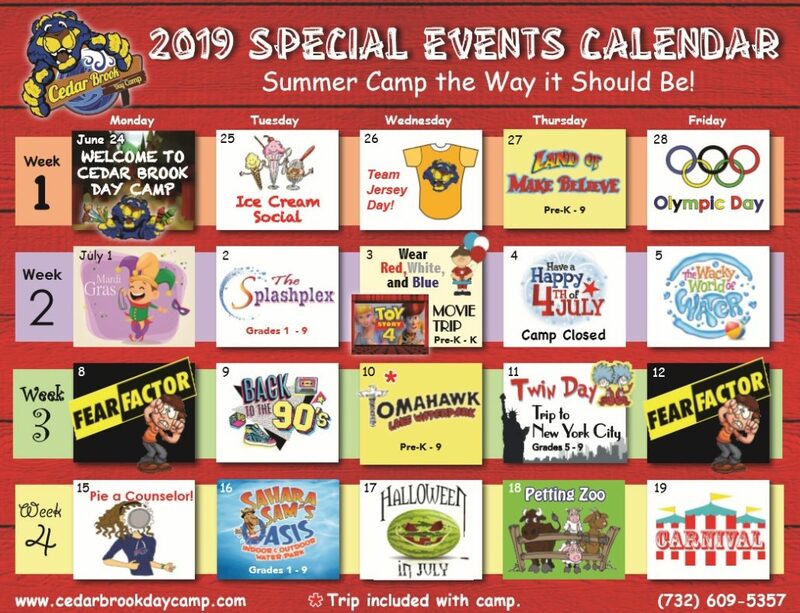 Every morning of every summer camp day, Cedarbrook Campers wake up to check their Special Event Calendar and see what awesome fun will be shared with their friends and counselors. Each day of the summer at Cedar Brook is what we like to call a special day. Campers and staff get an opportunity to show their camp spirit by dressing up or participating in different events like Wacky Wednesday, Twin Tuesday, and the Carnival. This calendar is a helpful reminder for each camp family what the next special day is! Not sure when the next Trip or Overnight is for your camper? Our Camp Calendar has you covered! Aside from each of the special days the Calendar has all overnights, stay late! • Camp Carnival Day – Rides, Games, Prizes, and MORE!! Big time fun!! • Ice Cream Social- Enjoy delicious refreshing treats and mix and mingle with fellow campers! •Tea Party- Wear your most elegant and dapper attire and join us for delicious sweets, treats, and tea while we enjoy the fellowship and company of one another! • Mid-Summer Gala – Campers trade in their play clothes for elaborate gowns, party duds as they participate in the camp’s annual black tie gala, highlighting the end of another successful summer. After a scrumptious dinner, Campers spend the night palling around and learning the latest dance moves from their instructors. • Spray Park Party - Younger campers enjoy a day in the Sun in our water Spray park! • Senior Camper Sleepover – Senior campers (Gr. 5-8) sleep over at Camp for a night of unforgettable fun creating lifelong memories “Camp Favorite”. •Junior Late Stay- Come on grades 3-4, let’s party!!! Join us for a night of endless music, dancing, and fun!! Bring a friend!! While all other campers go home after the camp day is over, junior campers’ grades 1-4 are invited to stay at camp and enjoy lots of exciting activities until 9pm!! • Campers vs. Counselors - Campers Challenge Counselors in an Array of Fun Games. • Color Wars – This event is the highlight of the summer for many; Color War is a 2-day event all-camp competition in which the entire camp splits into 3 teams (Red, White and Blue) for 3 extra-exciting days of athletic, creative and performance competitions- while teaching important skills such as teamwork and sportsmanship. Color War brings out the best in campers, creating memories that last a lifetime. • Wet ‘n’ Wild Day – A fun day full of water relay games, and other water play! • Petting Zoo- Feed, Pet, and even Ride some cool farm animals! • Lip Sync Team Building Show – Each group will prepare and perform a Lip Sync routine for the Camp Crown! • Parent BBQ & Camp Show -We invite all of our campers and their families to enjoy a wonderful summer evening barbeque, enjoy music, and the company of other camp families! Families have the opportunity enter various relay races as a team and compete against other families for a chance to win awesome prizes! There will also be raffles happening all evening, and best of all performances by our campers!! • Yachts or Not – A team building challenge and race in which each group constructs a boat using a cardboard box and duct tape. • Halloween in July – Campers are invited to wear their Halloween costumes for the day, take an adventure through the Haunted Trail, and go Trick or Treating across Camp grounds with their groups! • Bon Voyage Block Party-It’s so hard to say goodbye, but let’s go out with a “BANG”! Join us for our biggest party of the summer!!! There will be food, a DJ, games, face painting, and more! You don’t want to miss it!!! • Team Jersey Day – Represent your favorite sports team by wearing your jersey for the day! • Red, White, and Blue Day - In honor of independence day dress in RED, WHITE, AND BLUE from head to toe! • Twin Tuesday – DOUBLE TROUBLE! dress like a friend FROM HEAD TO TOE! • Wacky Hat/Hair Wednesday – Let's see how wacky and creative you can be! • Freaky Friday – campers dress up like a staff member and pretend to be them for the day! • Throwback Thursday –Dress in your best 50s, 60s,70s, 80s,90s wear! • Tie Dye Tuesday – Come to camp dressed in tie dye, or make a tie dye t-shirt at camp! • Ugly shorts day- Bring out your ugliest pair or pants or shorts and rock them for a day! On theme days the 2 groups with the most participants dressed for the day’s theme will win a surprise prize for the entire group!